We created Loc Hydration for the hair and scalp. Traditional shea butter has been used for generations to protect and rejuvenate the hair and scalp. We have taken it a step further. Our Loc Hydration is a natural blend of shea butter, black seed and other rich oils and ingredients to stimulate hair growth and keep your hair strong and hydrated. 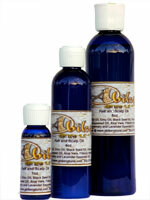 We offer it in Unscented and Loc Love (Lavender & Rosemary). Loc Hydration is used to moisturize the hair and scalp. It can also be used to twist and loc hair.